Hello and welcome to the 500th installment of the SWD. Within the scope of the Resistance of the Age, our units carried out a series of military operations against Turkish invasion army and its mercenaries in Afrin throughout the third week of June. As result of the operations in Afrin city center, vicinity of Shera and Bilbil districts, 6 mercenaries were killed and many others injured. On June 18, our units targeted a military vehicle with landmine. The operation targeting 5 elements of the mercenary group called “Sharia Court”, who’d come to the area to abduct a civilian from village of Kharab Shera, resulted in death of 2 elements while 3 of them were heavily injured. On June 22, Turkish invasion army and its mercenaries launched a large operation in vicinity of Afrin’s Bilbil district with participation of several UAV’s. Operation forces withdrew shortly after the operation had begun without achieving any of goals. With the succesful operations in the past week, the number of deaths of Turkish invasion army and its mercenaries has risen to 2485. Unknown gunmen assassinated two elements of Jabhat Tahrir Suriya, as well as a security chief and former commander of Suqour al-Sham on Masaya street in the city of Maarat al-Numaan. Syrian Arab Army and allies captured Abidin in Al-Yarmouk basin from the Islamic State-affiliated Jaysh Khalid ibn al-Walid. 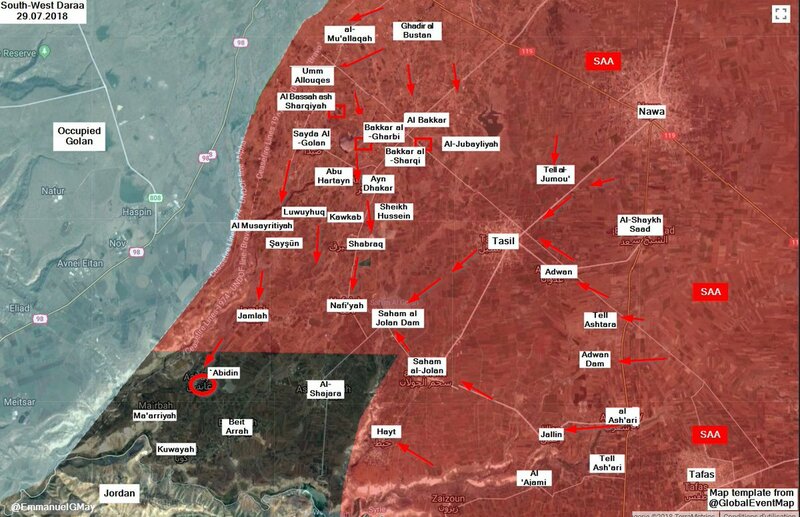 The two sides also clashed at the outskirts of Al-Shajarah, with reports that the Syrian Arab Army killed Jaysh Khalid ibn al-Walid’s emir of Al-Shajarah, Abu Walid al-Masri. Islamic State’s Amaq Agency stated that a suicide attack targeted Syrian Arab Army’s positions in Hamata area in Al-Yarmouk basin. Reports claimed that around 50 elements of the Syrian Arab Army were killed and wounded in the attack. Unknown gunmen assassinated the former commander of the Free Syrian Army’s Al-Firqat 46 Musha (46th Infantry Division), Yasser al-Tawirish in front of his house in Inkhil, north of Daraa. Al-Tawirish was one of the most prominent commanders/leaders who decided to reconcile with the Syrian government. Reports surfaced about two groups of residents clashing near Zuhur al-Jabal east of Al-Suwayda city, as both groups reportedly thought the other group belonged to the Islamic State. According to the same reports, four individuals were killed and one wounded in the incident. Afghan National Security Forces killed three and wounded two elements of the Islamic Emirate of Afghanistan (Taliban) in Shirin Tagab district. Two elements of the Islamic State surrendered to the Afghan National Security Forces in Chapa Dara district. Islamic Emirate of Afghanistan killed four and wounded one element of the Afghan National Army in Nari district. Afghan National Security Forces killed an element of the Islamic State in Nazyan district. Islamic State’s Amaq Agency stated that the group conducted an inghimasi (suicide fighters) operation in the city of Jalalabad, targeting the headquarters of the ‘United States Agency for International Development’. According to the agency, 35 elements of the Afghan National Security Forces and USAID workers were killed in the operation. Islamic Emirate of Afghanistan killed one and wounded two elements of the Afghan National Police in Ghani Khel district. 17 elements of the Afghan National Security Forces defected to the Islamic Emirate of Afghanistan in Ahmad Khel district. Two Islamic Emirate of Afghanistan’s improvised explosive device destroyed two Afghan National Security Forces’ armored vehicles, killing and wounding 11 elements in Shewan area of Bala Buluk district. Islamic Emirate of Afghanistan’s snipers killed three elements of the Afghan Local Police in Shireen Jan Charrahi area of Nad Ali district.